Yesterday afternoon, after another hectic day at work, Rick and I opened up our mailbox at home and saw to our delight, the current issue of MidWeek, featuring cakelava in two different articles! MidWeek is a newspaper that gets mailed every Wednesday (some households receive theirs starting as early as Monday) to all the homes on Oahu. It has an incredible circulation and is a well respected publication here that has been around for years. Excitedly, and with a new adrenaline rush, we flipped to Page 6, to find our article, "Let Them Eat (Really Fancy) Cake" by Sarah Pacheco. Our eyes and bodies were tired but boy did we perk up when we read this article. It was one of our favorite press articles yet and definitely captured the spirit of what cakelava is all about. Rick and I had a recent interview with Sarah and a photo shoot with her photographer Leah Ball and answered a lot of questions both about our business and Rick's experience with Food Network Challenge. It was fun to interview with Sarah, who loves to bake and had a particular interest in this article. Jo McGarry's "Table Talk" column in the Food Section of MidWeek also had an article featuring cakelava. The focus of this feature was the celebration of the four Hawaii businesses being showcased on Food Network on April 4th and 5th. In what was quite a delicious coincidence, our Food Network Challenge: SpongeBob Birthday Cakes, premieres April 4th and the very next day three other Hawaii-based businesses will be shown on "Diners, Drive-ins and Dives." We'll be watching both for sure! 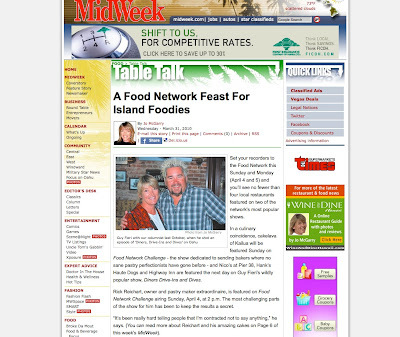 Rick had previously done a radio interview with Jo McGarry for her "Table Talk" show, which hasn't yet been posted as a podcast on Jo's site, Wine and Dine Hawaii, but as soon as its available, we will post it. 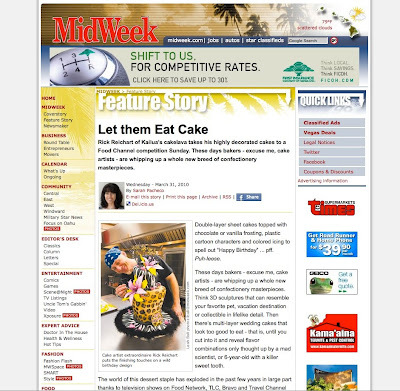 The MidWeek features were very special to us because they were one of the first local publications to write about cakelava after we opened in 2005. Linda Dela Cruz who has a column called "Entrepreneurs" wrote about cakelava in August 2005, only 5 months after we opened and we have a framed copy of it on the wall of our studio. To have MidWeek approach us for another article at this stage in our career made us extremely happy! This super funky, topsy turvy animal print birthday cake was made for Tomi's 27th birthday. 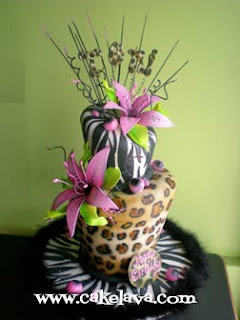 She requested to have both zebra and leopard prints integrated into her cake and also a "POP" of pink. She loved Rick's leopard print "Cake gone wild" design, and she wanted her cake to have a similar feel with lots of contrast. Rick handcrafted giant pink lillies with bright green leaves for her cake and put her name "Tomi" on wires playfully on the top of the cake. A chocolate lover, Tomi chose our Hot Fudge Sundae and Kona Toffee Crunch (with chocolate cake, naturally). We're not sure whether we should say "Rrrrowwww" or "Yummmm!" First we had the Rainbowlicious. 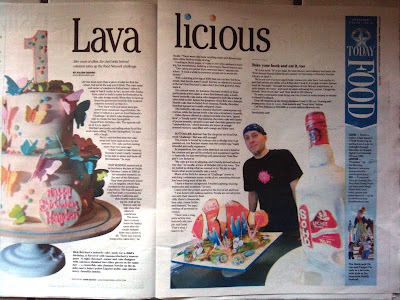 Then there was "Blogolicious", followed by "Lavalicious", the title of today's article on cakelava on the front page of the Food section of the Honolulu Star Bulletin daily newspaper. "Lavalicious" no doubt! a 2-page spread in the Honolulu Star Bulletin and a photo of the cake on the front page of the newspaper as a teaser, was a fantastic way to start our morning! Joleen Oshiro, a Food Editor and Arts writer wrote a wonderfully written article about our business and Rick as a designer, as well as his upcoming appearance on Food Network Challenge. The newspaper came to shoot on a weekend that was quite hectic where Rick was finishing up one cake and starting another and continuing this pace throughout the weekend. 3 of his cakes were shown in the article, a couple of them which you may recognize. The butterflies birthday cake was adorned with many fluttering handcrafted butterflies, in pretty pastels. The article made our day and we're so thankful for the support of the local community! You don't know til you make one of the most difficult cakes you've ever made, what it is going to look like. 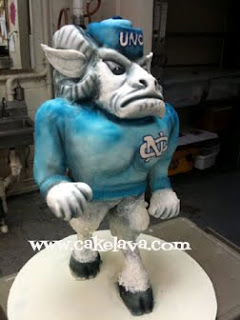 We now know what one of Rick's most difficult cakes of his career looks like, and it is a sculpted Rameses, the University of North Carolina Tar Heel mascot. Standing up. We accepted this order about 6 months ago, and we knew it would be a difficult cake when the order came in but we were also convinced Rick could make it. It would be possible. It wouldn't be easy, but it could be done. 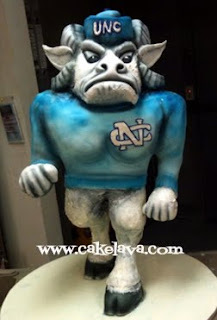 The sculpted Tar Heel was pretty enormous and he had a presence like a ram in a china, I mean, cake shop. Rick spent nearly a full day working on this cake, which is quite a bit of time considering he had several other cakes this weekend, as well as a media shoot and interview. This massive project that was the Tar Heel along with his other cakes, was one of the main reasons why Rick was unable to compete this week in his second Food Network Challenge. We would have loved to attend, but the timing just wasn't right. 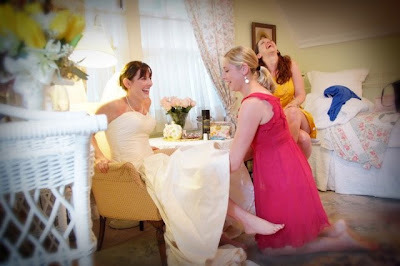 The Tar Heel was a groom's cake that our bride Mindy ordered to surprise her fiance with. 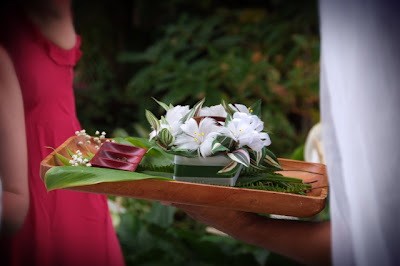 We delivered the cake on Saturday night -- V-E-R-Y C-A-R-E-F-U-L-L-Y to the Halekulani resort in Waikiki, where we had a short amount of time to place the cake then headed off to our next wedding which luckily was also in Waikiki. Having made the Tar Heel cake was excellent preparation for other standing sculpted cakes we have on order in the weeks to come. They are time consuming and stressful but you really feel a sense of accomplishment and relief when they are done. We're looking forward to our next one ... but not just yet. For Vanessa's 21st birthday, she could legally consume her alcohol and have her cake-filled liqueur bottle too! 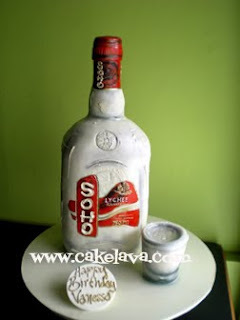 This sculpted SOHO Lychee Liqueur bottle cake was ordered by our client as a surprise gift to Vanessa, who loves the liqueur and thought it would be fun to have Rick make a cake shaped like the bottle. The lychee fruit and flavor is popular here in Hawaii, and has a wonderfully clean fruity taste that is used in dishes and drinks around town. No SOHO Lychee Liqueur was consumed during the making of this cake ... although we did think about it. Happy Birthday to Vanessa! 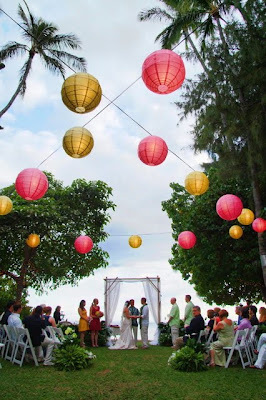 We're loving the new look of AOL's wedding planning site, AisleDash. It's filled with helpful articles, gorgeous wedding gowns and beautiful photo galleries, including one we particularly like, the Wedding Cake Gallery! AisleDash approached us for images a few months back and selected a number of them to include in their new gallery. 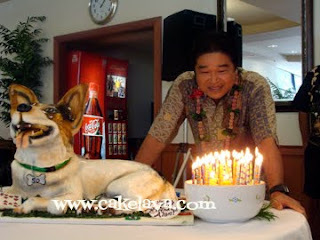 cakelava is honored to be included with some very well-known cake designers, including the amazing Ron Ben-Israel! We've gone through the gallery several times already since it was posted and it's a gorgeous selection of wedding cakes. Check it out! 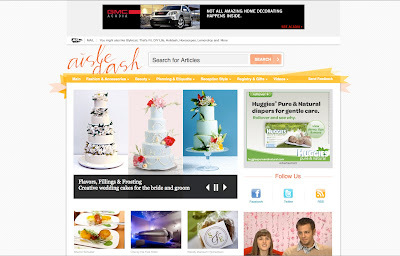 This is cakelava's second time being a part of the AOL "dash" family and it's always a treat to see our cakes displayed prominently on their site. Rick's sculpted cakes are also showcased on AOL's party site, "Holidash", for their Bizarre Birthday Cakes feature. 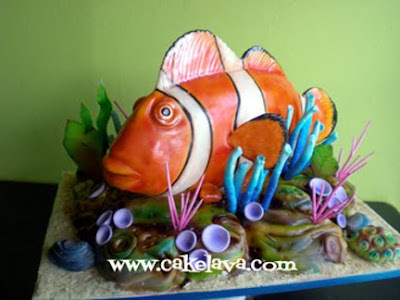 One of our most recent cakes was this sculpted clownfish made for our client Masaki's birthday. Last year Rick designed an amazing big jungle cake for his son, and this year, his wife decided to surprise him with a beautiful birthday cake of his own in one of his favorite flavors, Banana Nutella. Rick sculpted the colorful composition out of cake and made the ocean scene so realistic, it looked like the clownfish was ready to swim off the board. As luck would have it, we had a media shoot over the weekend and Rick's cute clownfish was nice and ready for his close-up ... before he was to be eaten later that night. just wanted to thank you again for an incredible cake! Customers and staff alike at Roy's Ko Olina were oohing and aahing over our clown fish. Our waiter even told us the chefs were amazed at how the cake was constructed. And, of course, it was delicious to boot! Another busy weekend with lots of fun new cakes, some of which we will be sharing with you on the blog in the days to come. 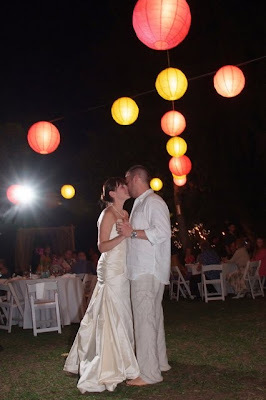 First we wanted to share a wedding that is near and dear to our hearts, as the circumstances surrounding this particular wedding was one we will never forget. A little over 2 weeks ago, on Saturday, February 27th to be exact, Rick and I found ourselves trekking off to the grocery store at 2:00 in the morning to stock up on groceries, gas and for the next 11 hours anxiously awaited the Tsunami heading our way. 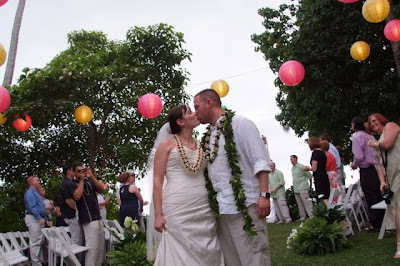 As we thought about our loved ones, we also thought about Elizabeth and Brian, a couple who we've never met in person, who would be having their most special day of their lives on a day when a tsunami was expected to hit the Hawaiian islands. 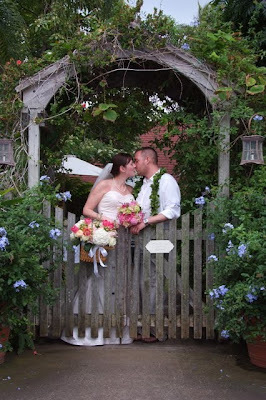 The fact that their wedding was booked at the Bayer Estate, a sweet oceanfront property where their ceremony would take place steps away from the water, made everyone involved, especially the couple, nervous that we would go with "Plan B" which was to move the wedding to a property far away from the ocean. 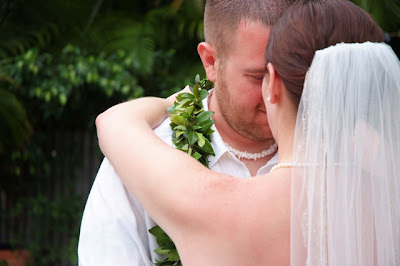 It was a heartbreaker to think about our couple, who flew in from Texas to celebrate their Hawaiian wedding and have to deal with such unfortunate circumstances, beyond anyone's control. As the clock ticked closer to the start of their wedding, I had been in regular contact with their coordinator, Susan O'Donnell, who had everything under control, being the liason between the property owners, the bride and her family and the vendors, including photographer Dave Miyamoto, The Catering Connection, and cakelava. Some of the vendors involved had their homes in an evacuation zone, but we were all committed to giving Elizabeth and Brian the best wedding we could. Rick designed for the couple an exquisite elegant wedding cake that had a lovely cascade of handcrafted garden and tropical flowers, shown above. The mixture of English garden and Hawaiian flowers found a perfect match at the Bayer Estate, a Victorian home on the east side of the island. Elizabeth and Brian chose our Strawberries Chantilly and Lemon Pucker flavors for their cake, but we don't know which flavor was selected to shove in each other's faces during the cake cutting (see below). 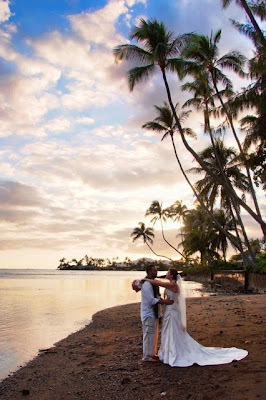 A BIG, big Thank You to photographer Dave Miyamoto for the images he sent us after their wedding. It was a huge relief for us to see a couple and their guests clearly enjoying themselves after what had been Hawaii's biggest scare in a long time. 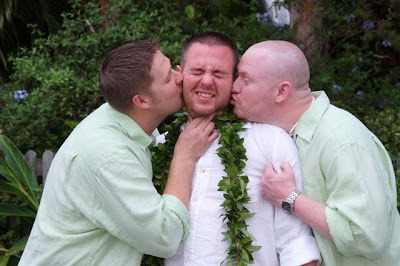 As you now know, the tsunami that hit was very minor and didn't do any damage, thankfully, and their wedding, all of our Plan A, went off without a hitch! We were especially touched to see a post to our Facebook from Elizabeth later that night, saying how much everyone loved the cake. We couldn't have asked for a better ending to our day! Congratulations Elizabeth and Brian! More new cakes to come! Aloha, 'til next time! We live for celebrations like last Friday's Doggie Rescue Party. 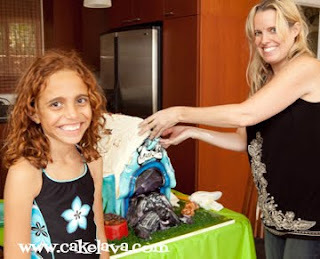 Parties with a purpose filled with creativity and of course, a super fun cake! 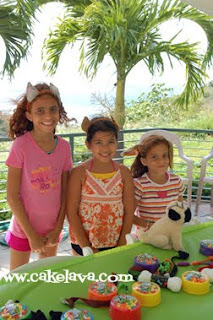 Our client's daughters are crazy about dogs. They own two adorable Shih Tzu's "Issa" and "Jazzy", and both have a desire to pursue a career involving dogs. One wants to be a Veterinarian or a doggie baker, and the other would like to own a rescue center. Their older daughter is a "walking dog encyclopedia". 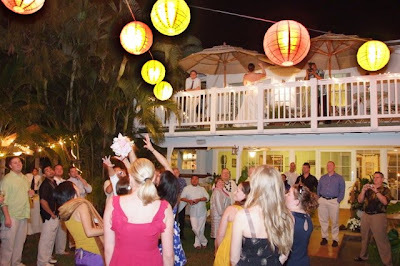 The party took place at their residence on "Furlough Friday", when some Hawaii state workers take a mandatory day off. It was the perfect time to get a bunch of adults and children together on a day when they would normally be off, and have a big party. Children attending the "Furry Furlough Friday Doggy Party" were invited to bring along their favorite stuffed animal to visit their play Veterinary Center. They were also asked to bring an item to donate to the Animal CARE Foundation. ACF needs any item for the care of animals such as toys, leashes, organic food and cleaners, pet beds, dust-pans, towels, brushes, etc. This gesture is one we find very touching, when children are encouraged by their parents to donate to an organization in lieu of any gifts that they may receive. One of our clients (with the Death Star cake) had children bring a book to donate to a local foundation rather than gifts for her son. We're hoping this is a trend that will continue to catch on! Rick sculpted a blue super cute doghouse with Jazzy peeking out of it. 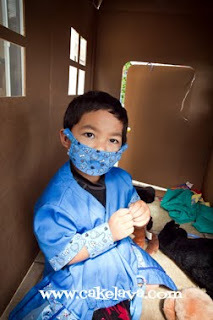 He used different shades of blue, at the request of our client, and put their dogs names on the house. 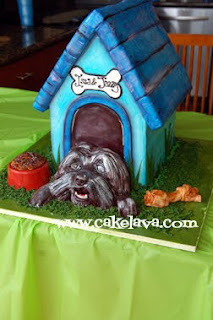 The entire doghouse, dog and bowl was made out cake, Chocolate Dream to be precise, and was quite large, around 100 servings. Well basically this all started when the whole family was at formal tea on Sunday in Manoa and my 9 year old asked to volunteer at the Humane Society because of her obsession for dogs. I said she couldn't handle that because they put the dogs to sleep if they aren't adopted and she started crying hysterically for the dogs causing a scene. I had to right it in a big way! We started researching no-kill shelters and how kids their age could get involved. (No we are not adopting 50 dogs!) Animal CARE Foundation seemed to have the best philosophy and be well established and respected in the community. We drove by as a family to check it out and called to see how we could help. 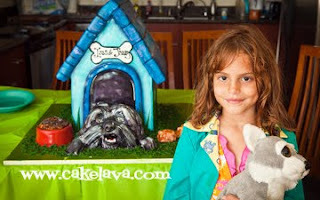 This led to the dog themed party with the Pièce de résistance, the cake! Rick surprised us with an exact replica of Jazzy our beloved pooch! The dog house, bowl and bone looked so real and little fingers kept poking at them until served to satisfy curiosity. The colors were beautiful! It was a wonderful gift for the girls and their friends. It all tied together the meaningful cause and fun reason for gathering together. Guests were asked to donate to the Foundation. We thought about having actual dogs at the party then decided against that possible lawsuit by bitten guests. The girls dream of having their own rescue foundation with a doggy cafe and we are researching what is involved. For now we set up a play center for toy creatures. We did doggy crafts, games, ate human puppy chow and such. Fun times. 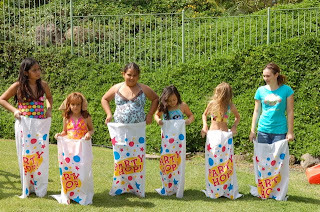 Sometimes kids get caught up in parties being all about them and we thought this would be a great way to encourage community service and overall a more giving spirit. We like to encourage when the kids are involved in nature and get them away from video games or Hannah Montana. The parents had a fun time and ate lots of cake too! And yes we bounced in the bouncy! The party and the dog cake were a huge hit, and most importantly, the animals at the Animal CARE Foundation were also happier with their new gifts, courtesy of the children! A big Thank You to our clients for making this very special day possible! We had a great weekend with some very fun cakes! 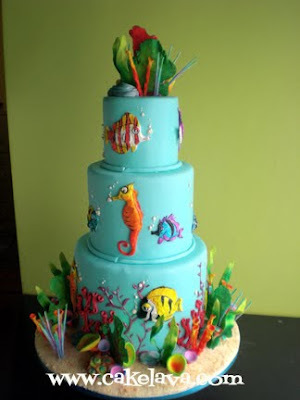 Saturday's birthday party at the Waikiki Aquarium could not have had a cake that was a better match than this colorful under-the-sea cake. Our clients rented out the Waikiki Aquarium after hours and allowed their guests free reign on the exhibits, then continued the celebration with their delicious Strawberries Chantilly and Hot Fudge Sundae flavored cake. Everything on the cake was handcrafted by Rick and painted by hand, and had an unbelievable amount of detail. Rick went for a more realistic approach to this cake, making fish that would be instantly recognizable. 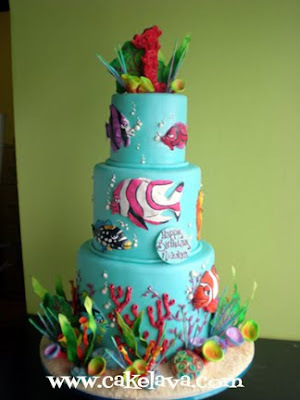 The vibrant kelp and coral seabeds were delicate and lifelike and completely edible, as was the entire cake. The cake was designed to be enjoyed from any angle, including the back. It was a labor intensive design, but very much worth the time spent when we saw our client's reaction, as well as the guests who came over to admire the cake up close. Happy Birthday, Nicholas! Nicole's giant sculpted cupcake wasn't the first one we've made, but the first one that had been ordered for the purpose of a child's photo shoot. 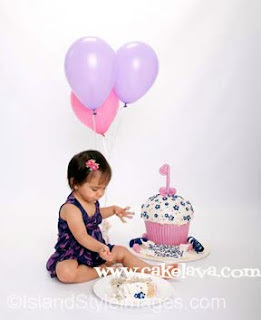 When this adorable little girl's parents called us to place the order, we were told that they wanted the cake to be used as a prop in a photo shoot they had arranged for their daughter. I asked "don't you want to eat it?" The response was of course they wanted to eat it but they also wanted their daughter to be able to interact with the cupcake as much as possible because they thought that would make for really cute photos. 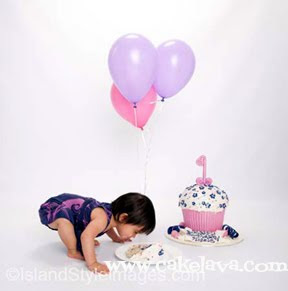 When they saw our flavors and chose the super yummy Banana Blueberry Mascarpone, they were determined to find a way to remove a slice for their daughter to play with in front of the camera, and not compromise the look of the cake or destroy it in such a way that they wouldn't be able to eat it. Rick designed the sculpted cupcake in the colors of the dress Nicole had planned to wear for her birthday shoot, and wanted it to be striking piece with lots of contrast which we thought would photograph well. 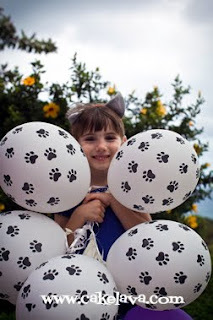 Our client sent us photos of their daughter taken at the shoot, which was terribly cute! Rick Reichart Featured on KITV-4 News! Rick and I would like to thank Paula Akana of KITV and our clients Bobbi and Alan for their support. Working with a client as excited about her cake as Bobbi was is always a pleasure for us, and getting to see Alan's reaction both in the photos and on TV was the icing on our cake. 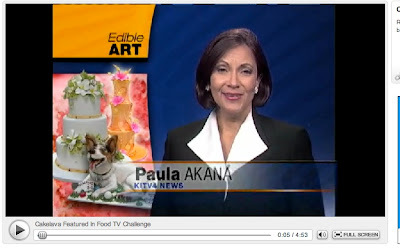 Paula Akana is just the sweetest person and was so complimentary about our cakes. She is one hardworking lady, anchoring the 5pm, 6pm and 10pm news! Go Paula! Thanks to everyone who tuned in and sent their congratulations on the segment. Five Candles on the cakelava Cake! About a week ago when our work life was particularly hectic, Rick reminded me that we were approaching our Five Year Anniversary for cakelava. Five Years. This is a big deal. Many businesses don't even make it to the five year mark, especially in this economy. 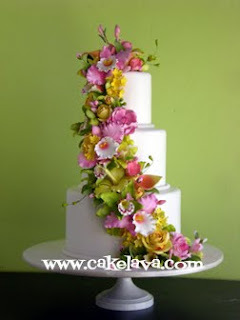 This was a cause for celebration, we should be planning some awesome party to commemorate the success of the business, but the truth is, I almost forgot altogether that on this day, March 1st, in 2005, we took the bold step of starting cakelava. It's not that the date and what it represents is not terribly important to both of us, it was more the fact that we've been so preoccupied with the frenzy of the business -- making cakes, taking orders, radio, television and newspaper interviews, having just finished one Challenge, and having to turn another one down recently, and of course, the excitement of our April 4th airdate, which is about a month away. Earlier today Rick and I were on the phone with a newspaper journalist and I told her that our company had been in business for Five Years. Then I paused, realized how timely this statement was and said "Today." Five years TODAY and were it not for this prompt, I may have forgotten again. Terrible, I know! 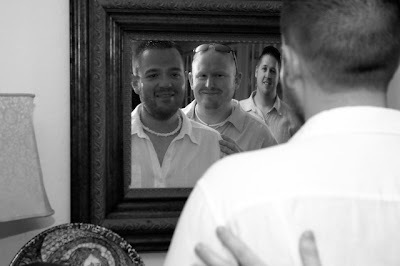 This was more about being preoccupied with looking forward than taking a moment to look back and reflect upon the years, which deserved the same attention. Rick reminded me how important it was to honor our efforts leading up to the present because we have accomplished so much in a short amount of time. We have quite frankly, worked our asses off, every day, with very few days off, taking "vacations" that usually last about 3 days and having little time for friends and family. We count our blessings every day for the support we've received from our family and friends, our clients and the media. It's made all the sacrifices worth it! As we reflected on the accomplishments of the past five years, we were at a loss of where to begin. Honestly, just moving to Hawaii, one of the most expensive states in the nation, where the humidity levels can be truly brutal on cakes and cake resources few and far between that was quite an accomplishment. In these past five years Rick has been making the best cakes he has ever made. That is an accomplishment. The move into our retail space was a huge turning point for our business. There isn't a day that goes by that we don't feel tremendously lucky to have our studio and the support of our clients. With each passing year, the cake requests have been getting more interesting with wilder designs and an anything goes mentality that we never thought would be possible given that we're a very small company on a little rock in the middle of the pacific, approximately 2500 miles from the mainland. We feel particularly thankful for all the incredible people who we've met over the years. People who have believed in our work from the beginnng and who have ordered cakes, vendors who we have had the great fortune to work with, other cake artists, bakers, and bloggers who have reached out to us in their emails, on the phone and various social networks, and people in the media who have given us opportunities beyond our wildest dreams. Getting to meet the people we have over the years is something very precious to us and one of our biggest accomplishments! 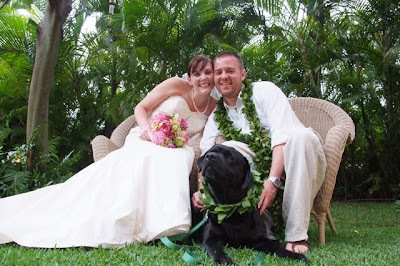 Then there is the press, which we've been fortunate to have regularly, starting with MidWeek here in Hawaii, in an article called "Entrepreneurs" that came out within a couple months after opening our business. 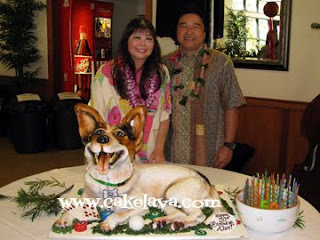 We remember the call from People Magazine, 3 years ago, when we were selected as having the best cake in Hawaii. The first call from the Food Network, for the "Extreme Cake" Challenge also that same year and a start of a long and rewarding relationship with them. The call from the Art Director at Grace Ormonde Wedding Style Magazine saying how much he liked our cakes and wanted to put us in the magazine. It was one of Rick's dreams to be in Wedding Style Magazine, and his cakes have appeared in 3 issues. 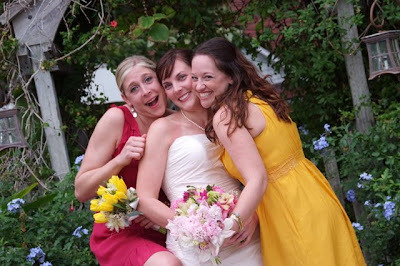 Other big industry magazines followed, Bride & Bloom, Your Wedding Day (YWD), and Get Married. Having our cakes regularly featured on Brides.com and the relationships that blossomed as a result was a wonderful accomplishment. The day we received the invitation from Abby Larson to be a Little Black Book VIP vendor and Carrie Sellman of Half Baked Cake blog to be a Top Tier Vendor was also a great day! 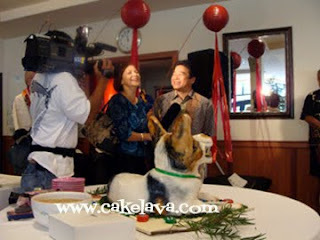 Another huge accomplishment that meant so much to us was having cakelava featured in American Cake Decorating Magazine. The feature was several pages and it was a huge honor to be in such a widespread and respected cake industry magazine. We can never forget being on the home page of both AOL and MSN. 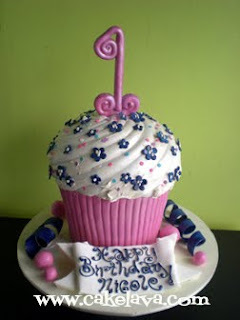 Once for the "Bizarre Birthday Cakes" feature and our "Cakes from the Pros" feature on Delish.com. We have also been extremely lucky with television opportunities. Aside from Food Network Challenge, Rick has also been recruited by TLC's "Ultimate Cake Off" which we had to turn down, and also asked to audition for WeTV's "Amazing Wedding Cakes". We cannot overlook the importance of the "Cakes for a Cure" fundraiser. We are very proud of the beautiful cake Rick designed for the American Cancer Society's Relay for Life "Cakes for a Cure" fundraiser calendar, which will be released next month. Being able to share his art along with other known cake designers to help raise funds for cancer survivors is somethng to be very proud of! Thank you, Patti for the opportunity! We also cannot overlook the importance of our blog and how it is has enriched our lives, having all of you in our community. You've made our world smaller and inspired us with your enthusiasm for cakes! Now that we've had time to reflect and honor the memories of the past five years, we are excited to look towards the future. New opportunities are presenting themselves everyday and we can't wait to see what the next five years has in store for us!